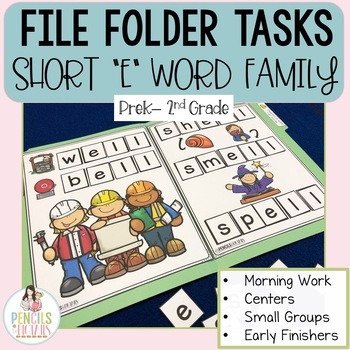 Short E Word Family Folder Tasks - ELA Centers, Morning Work, & Early Finishers! 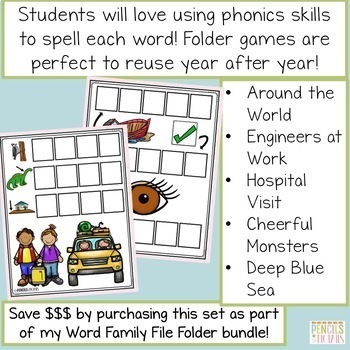 These "Short E Word Family" File Folder Tasks are perfect to keep students engaged while giving them vital word building practice! Your students will love all of the beautiful illustrations and you will love all of the independent practice students are getting! My students LOVE this HUGE set of CVC Word Builder Games! Mega CVC File Folder Bundle - 25 Folder Games! 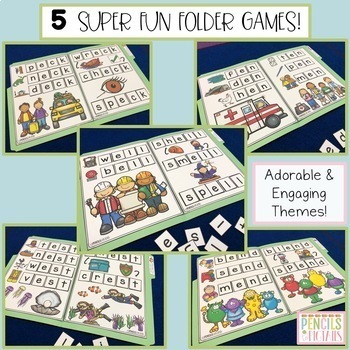 ***Click below to view a free video about how to organize and implement file folder games in your classroom! 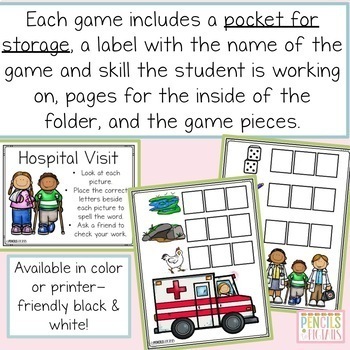 In this resource, you will find 5 unique games with a pocket for storage, folder label, tab label, backgrounds, & all of the pieces in color options & black & white! I like to introduce these in a small group setting and later students work on them independently. My students love to use them when they finish their morning work and they are perfect to use as part of your center rotations. I also teach an adult English class and my students LOVE to practice their English skills with these! I have included photo instructions to make it extra easy on you as you get them set up. These games can be pulled out year after year and they are perfect to store as they fold up completely flat! Be sure to check out the thumbnails and preview to get an up-close look at the beautiful format and engaging activities included. Try these other fun & educational resources! • Interactive Writing Center for the Year! • Chicka Chicka Boom Boom - STEM, Crafts, ELA, & More! • 5 Green & Speckled Frogs - Paper Towel Craft, STEM, ELA, Math & More! • 5 Little Ducks - Paper Towel Craft, STEM, ELA, Math & More! Click on the ✮ beside my store name to add me to your favorite sellers. You will be the first to know about new freebies & fun products. All of my products are 1/2 off for the first 24 hours!